Picking between an up cut or down cut CNC router bit can be a daunting task especially you are just starting out. Without going into to much detail here is a little info to help you choose the correct bit. 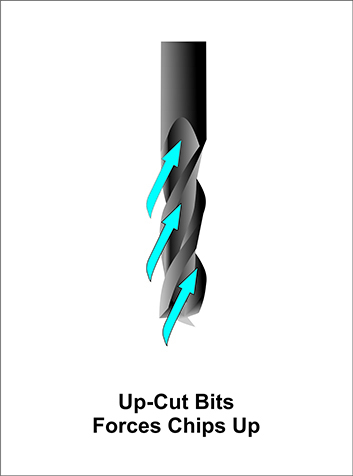 Up-Cut bits forces chips up. Very efficient at keeping chips from building up in the cut area. ing possibly breaking the bit. Will try to lift your application off the table. Will leave a rough frayed top edge on wood. 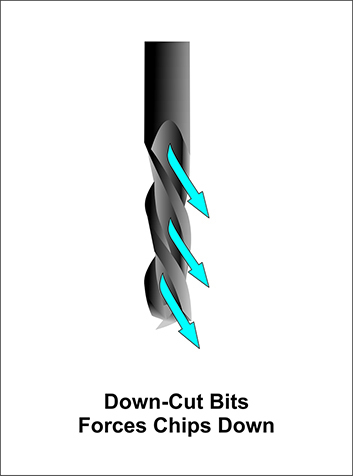 Down-Cut bits forces chips down. Leaves a nice clean edge. Pushes application down towards table. Not very efficient at removing chips from cut area. Which can lead to a build up of chips, causing binding possibly breaking the bit.